We handed out nearly 2500 of these puppies. Art image by Justin Atherton. Graphic Design by Mark Gonyea www.mroblivious.com and Connie Coleman www.conniecolemanstudio.com. The master himself, Nikolai Gogol. 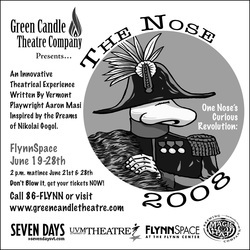 Here we see the second edition buttons for The Nose, created by Justin Atherton http://www.nograce.com.